20/20/20– This challenging and fun class can be geared to any fitness level. It is a fun combination of cardio using the step, weights, and core work on the floor. Barre Bootcamp– inspired by ballet, this high intensity barre class targets your arms, core, thighs and booty to help you create a long, lean dancer’s body. Billy’s Power Hour– starts out with a strong cardio warm-up, followed by a series of strength training exercises using barbells and dumbbells. This workout is designed to work the entire body. Billy welcomes all-beginners, intermediate, and advanced fitness enthusiast. Cardio Interval– This class alternates high intensity cardio interval, (such as plyometrics) with lower intensity strength exercises. The intervals challenge the body by bringing the heart rate up and down for the best calorie burn. Cardio Sculpt– This is a choreographed class with Hi/low impact aerobics and strength exercises using dumbbells. Dance Jam– This fun class is anything goes….disco, pop, reggae ,hip hop, funk and more. Have fun, sweat and burn calories in this energetic dance class. DDT-Design Training & Dance(DTD)– is Pro Body Designer J-Rockstar signature workout routine. Boring workouts don’t work, and will leave you unmotivated. Design Training & Dance(DTD) is a sizzling workout routine that uses ﬁtness & dance as its core. If your goal is to have a six pack, and improve your overall ﬁtness then Design Training & Dance(DTD) is perfect for you! Suitable for all ages, every part of this workout is designed to optimize your body’s ability to melt away the stubborn belly fat hiding your abs. (DTD ) can burn between 500-1000 calories depending on the energy the individual puts into the session. J-Rockstar’s will assist in your body transformation using stylish ﬁtness & dance movements performed to energetic music (Hip-Hop, Reggae, R&B, Dancehall, and Hits). You’ll totally forget you’re burning fat, while getting in the best shape of your life. Hatha Yoga– is a general category that includes most yoga styles. It is an old system that includes the practice of asanas (yoga postures) and pranayama (breathing exercises), which help bring peace to the mind and body, preparing the body for deeper spiritual practices such as meditation. Mixed levels yoga– A Yoga flow in which Students will focus on linking conscious breath with a vigorous and mindful flow, through the exercises. This class is geared to ALL Levels of fitness. Shansanity– This total body workout uses principles of High Intensity Interval Training. Each week the class is different. The instructor uses body weight, dumbbells, barbells, balls, bands etc, to give the participants an intense workout. The class can still be modified for beginners! 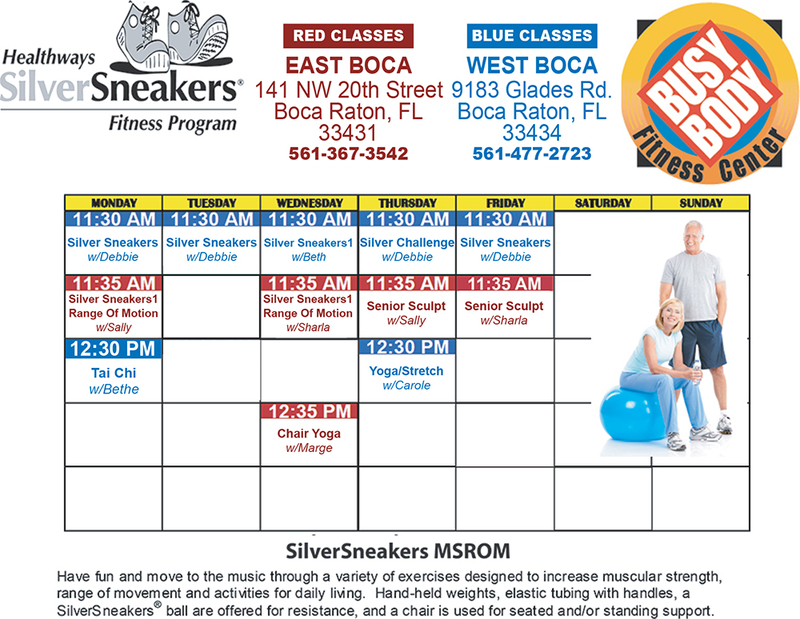 Silver Sneakers 1 range of Motion– Have fun and move to the music through a variety of exercises designed to increase muscle strength, range of movement and activities for daily living. Hand-held weights, elastic tubing with handles and a SilverSneakers ball are offered for resistance. A chair is used for seated exercises and standing support. This class can be adapted by the student depending on their fitness level and abilities. It is suitable for beginning to intermediate skill levels…. Silversneakers Yoga– Move through seated and standing yoga poses designed to increase flexibility, balance, and range of movement. Finish with restorative breathing exercises and final relaxation to promote reduced stress and mental clarity…. TAE TEK– The perfect combination of martial arts, aerobics and choreography. A HIGH intensity class with a plus! Class may be modified for all levels. Tresa’s Power Hour– Welcome to the the “Saturday AM Party”!!! Bootcamp…HIIT…Core &more. Cardio bursts accompany a full body workout and a core challenge completes the hour!!! TRX– Born in the U.S. Navy SEALs and developed by Fitness Anywhere®, TRX Suspension Training® is a revolutionary method of leveraged bodyweight exercise. Build power, strength, flexibility, balance, mobility, and prevent injuries, all at the intensity you choose. Yoga (with Carole)– This gentle yoga class will teach you to relax your mind and your body. You will leave the class feeling stretched, and “fresh”. This class also sometimes uses mediation, and you must arrive on time. ZUMBA®– is a fusion of Latin and International music / dance themes that create a dynamic, exciting, and based on the principle that a workout should be “FUN AND EASY TO DO.” The routines feature aerobic/fitness interval training with a combination of fast and slow rhythms that tone and sculpt the body. *Not valid for out-of-town guests, must show local ID. $10 per day for out-of-town guests.